If someone were to ask me a month ago if we were going to meet our deadline of moving in AND finishing our renovation, I would reply with a cautious “yes.” But as luck would have it, disaster struck and it came in the form of water. 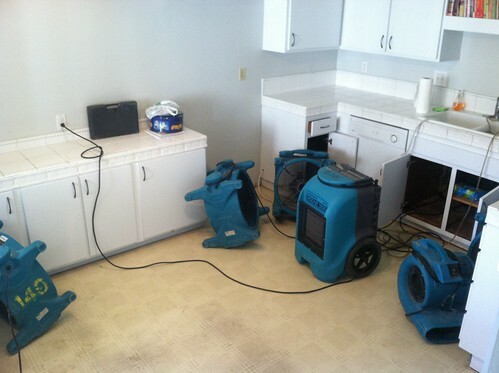 When Jim Nichols and the rest of the Bolt Flooring crew started removing the existing carpet and laminate flooring to replace with the carpet and laminate we’d carefully hand-selected, they found water. Under the kitchen and pantry floorboards was a thin layer of clean water— and it extended to all the surrounding walls. While that may not seem like a lot, it appeared to have been there a while; some of the baseboards had signs of mold. Panic struck Paul — and, of course, me, fielding these panicked calls from work — and all renovation progress was stopped cold. Where did the water come from? How long had it been there? Is it still actively dripping? Paul’s initial reaction was to call the plumber to have it (whatever “it” was) fixed immediately, and I consulted with our realtor who suggested that we call our home insurance. What followed is really just a brief rundown over what happened over three, stress-filled days. The following morning, our home insurance company sent out a plumber to diagnose if it was from any active leaks. From the process of elimination, he (and well as a few other people) determined it was due to the water line hooked up to the previous owner’s refrigerator ice maker. Here’s what we know: when the previous owner moved out, the movers she hired inadvertently left the ice maker line on the floor, where it continued to drip from for several hours up to possibly several days. 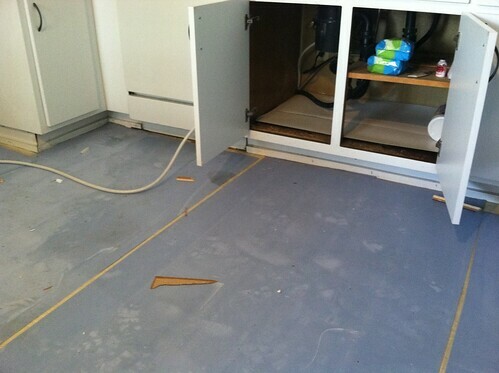 The water collected under the floor boards and was ultimately discovered by our flooring guys a few weeks later. With the water stagnant under the floor boards, it did quite a bit of damage. 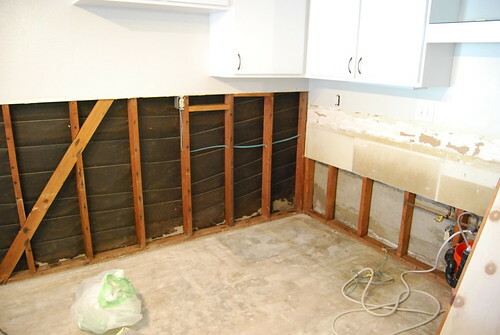 Our insurance company determined that the kitchen walls, the pantry and adjoining bathroom wall needed to be dried out, demolished and replaced. And say goodbye to the bottom cabinets and counter tops— they all had to be torn out and some of which were destroyed. Instead of prepping to move in on schedule, we had to deal with the aftermath. 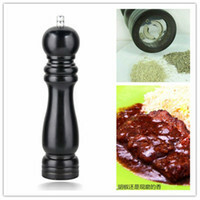 All the hard work we put into painting the kitchen and pantry and lining the drawers was flushed down the drain. Installation of carpet continued upstairs and in the stairwell, but downstairs has to wait until reconstruction of the kitchen, pantry and bathroom has been finished. The monetary damage was $1,000 deductible per our insurance company, who has picked up the tab for lead testing, asbestos testing, demolition of water-soaked walls and cabinetry, and several days of drying. They’re also taking care of reconstruction and painting of the walls and reconstruction/replacement of cabinetry and pantry. And, of course, we’re staying at our current residence another month, courtesy of the insurance company. Walls-in insurance is your friend. In many states it’s a requirement during escrow. It covers you as soon as you close your home. Always have a home inspection AFTER the previous owner has moved out. We had our inspection while the owner was still living here, and his moisture meter read “bone dry” everywhere in the house. The day we discovered the water (about 3 weeks after the home inspection) the moisture meters went off the chart along all the kitchen baseboards, cabinetry and tangental drywall. As stressful as this was (is), always maintain a cool head and sense of humor. It goes a long way toward making the days more bearable. Oh, man… that’s insane! I am so glad you guys had the insurance and that it worked out for you. Can’t wait to see the house when everything’s done! Oh, I know the pain of water leaks… But, I’ve got an even better (worse?) story than yours. Last summer, I was home on maternity leave with our newborn son (about 4 weeks old?) when water started dripping from the ceiling in the kitchen. Our upstairs neighbor’s bathroom renovation sprung a leak somewhere along the line and it had been leaking since the night prior. Thankfully, our landlord (a lawyer, no less) was very efficient and credited us for everything (from the extra power to run the fans to giving us a break on our rent since we didn’t want to live in a motel); the renovation company took care of everything, including packing up our stuff for us; and my mother-in-law (who was visiting for the week) helped prop up my flagging bits of sanity while our kitchen was repaired (a two-week ordeal). Just keep track of all your expenses and submit everything and anything for reimbursement, from energy bills to the cost of those wasted cabinet liners. You never know what may eventually get reimbursed above and beyond your deductible! 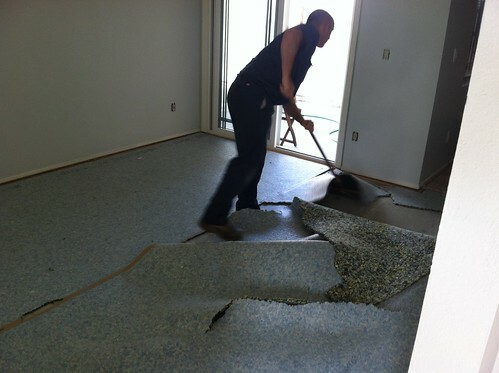 One of our tips for home renovations is to plan ahead, but sometimes there are just events that cannot be planned for. Glad to hear that you were able to remain calm and collected rather than stressing over the problem. Can’t wait to see what the final product of your renovation looks like. Oof… water has to be one of the sneakiest kinds of damage. Sorry it pushed your schedule back, but I’m glad your insurance is taking care of it! We’re going through all our insurance policies at the moment, reviewing deductibles and coverages and whatnot and insurance is so not fun to think about. At least you get new kitchen cabinets? Yikes! This is quite the adventure for you guys. So glad your insurance is covering it and it sounds like everything is working out, despite the stressball start. Wow, that sounds super stressful! I’m glad insurance kicked in. Thanks god for insurance! Seems like this whole “getting a house” thing is turning into quite the adventure – but it will just be that much more satisfying when you finally get all settled in. Too bad you’re not moving in quite on time, but thankfully it’s being taken care of. Thanks for sharing your house stories! Hats off to you. The way you managed all the stressful things is really appreciating. you should thank to insurance to save your loss. After reading this i am also thinking over insurance covering. By the way thanks for sharing your story. I hope a lot of people learn from this. We’re almost there where we can look back on it and laugh on the incident. Almost.